New Zealand: Goodbye to the Union Jack? The government has decided it wants a new flag. These options did not make the final 40, though the Washington Post did ask New Zealand to reconsider. However, as the selection panel said in an open letter, “A great flag should be distinctive and so simple it can be drawn by a child from memory.” The letter went on to say that the flag should and will represent how New Zealanders see their country today, and what it stands for. The 40 finalists, with many variations on the silver fern, are here. A final four will be brought to binding referendum in a few months and next year a vote will decide whether to keep the original or to switch to the new option. 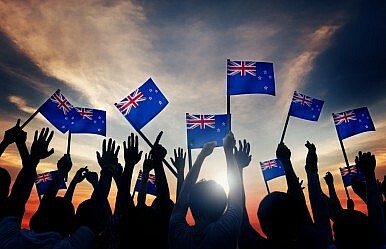 Should Kiwis decide that their new flag better represents the nation than their Southern Cross and Union Jack, Australia will be one of the last countries to retain the remnant of British Imperial glory. Ultimately, the country voted to keep its old flag, but the year-long process sparked national conversations about identity.